Identity theft occurs when someone gets vital information about you – such as your name, Social Security number, bank or credit account numbers, etc. – and uses that information to commit fraud against you. By the time you figure it out, you can be much poorer. And straightening the problem out can take tons of time and effort. The Federal Trade Commission (FTC) estimates that as many as 9 million people have their identities stolen annually. Identity thieves can be very low-tech, like pickpockets who lift your wallet with your credit cards and other ID, or Dumpster divers who look through the garbage for credit slips and other identification. They may steal credit card applications or bank statements out of your mailbox. They also can be very high-tech, like hackers who get into computer data banks and steal identifying information. Sometimes they are employees of banks or other institutions who steal information from their company data banks. Sometimes they call or email you with surveys or questionnaires and get you to give them the information about yourself. Once they get the information, they can use it to charge things to your credit accounts, to get money from your bank accounts or to open new credit or loan accounts under your name. They may have the bills sent to a false address so that you never see them. Identity thieves even may use your name and other identifying information if they are arrested, so that when they do not show up for a court date, the police come after you. You may not know there is anything wrong until you start getting bills for things you never bought, you find that your checking account has no money in it, you start getting harassed by bill collectors or you find the police at your door. What can you do to protect yourself against identity theft? First, exercise some common sense. Don't carry extra credit cards or your Social Security card or passport in your wallet. Don't put your Social Security number on your checks or driver's license. 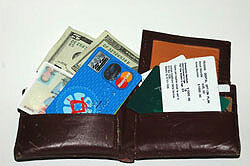 When you shop, put credit card slips in your wallet or purse rather than in the bags. Shred or rip up credit card slips when you no longer need them, and destroy credit applications that come to your house. Put a lock on your mailbox. Don't give out personal information to people who call on the phone or who send an email asking you to provide or verify information unless you are certain that they are on the level. Do your online shopping only at secure sites. When you create a password for a password-protected site, don't use something obvious like the letters of your last name, your birth date or your Social Security number. Get your credit report at least once a year from the three main credit reporting bureaus: Equifax, Experian and Trans Union. But don't go to the agencies' Web sites. Instead, request your free report by going to www.annualcreditreport.com or calling 1-877-322-8228. All Americans are eligible for a free credit report once a year, or more often if you meet several criteria, including the suspicion that you are a victim of fraud. In addition, each of the credit bureaus offers a credit monitoring service for a fee. If you choose to use such a service, which is also available from other sources, make sure you understand what you are getting for your money. Once you have received your credit report, look it over carefully. If you have been a victim of identity theft, it will show up in your report. You will see charges or accounts that you did not authorize, or other irregularities. Contact the fraud department at one of the three credit bureaus and place a fraud alert on your file. Whichever credit bureau you notify will notify the others. With a fraud alert filed, anyone being asked to make changes to any existing account of yours or open a new account in your name will contact you first. Close any accounts you know have been compromised, as well as any accounts you did not authorize. The FTC offers an ID Theft Affadavit you can use to dispute accounts or charges. For the affidavit as well as other information about identity theft, visit the FTC Web site. You also can call the FTC’s Fraud Hotline at 877-IDTHEFT. File a police report with your local police department, and get a copy of the report. You may need it to resolve credit disputes. Once you have taken these steps, continue to monitor your credit reports every three months for at least the first year, and check your other financial records carefully for at least several months. And continue to do all you can to safeguard your identity.